Aces High is a series that attempts to connect the London Spitfire to the fans by providing information and interviews from the team so that you can get to know who they are that little bit further. This is the third episode of Aces High with previous posts being an interview with head coach Beoum-Jun “Bishop” Lee and an introduction to the team in Meet The Spitfire. Today’s post as mentioned, is an interview with Jae-Hee “Gesture“ Hong who plays the main tank role. 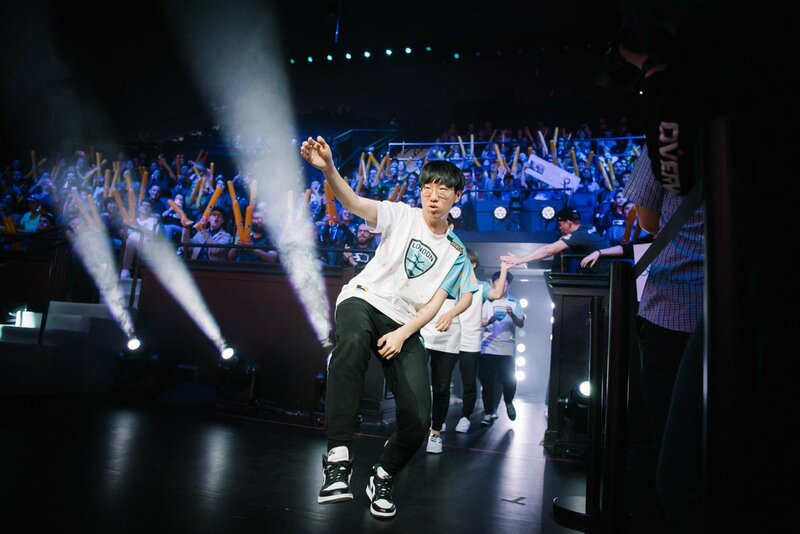 Gesture is an important member of the team, having joined the Spitfire with the rest of the APEX Season four winning GC Busan. Gesture is well known for his Winston play and his performance so far has seen him become the teams starting main tank. While Gesture has stepped up inside the game, outside of it he’s started to let his personality shine through. In recent weeks he's become the pub landlord of The Spitfire and his stylish entrance flying the plane to the stage against the Philadelphia Fusion in week one, has allowed Gesture to quickly become a fan favourite. I’ve been able to ask him a few questions in regards to the team, the league and moving from South Korea. Hi Gesture, first of all thank you for taking the time out of your schedule to answer a few questions. You were part of the GC Busan team that won APEX Season four and now representing the London Spitfire in the Overwatch League. How different is the level of competition now to then? The league is full of talented players and strong teams made of them. The competition is much higher than it was during APEX season 4. The London Spitfire are made up of the majority of GC Busan and Kongdoo Panthera, you've started off really well. How easy has it been for you all to gel together as a team? Other than our rough start during the pre-season, we have bonded together very quickly. During the off season you've added both Orisa and Reinhardt to your hero pool. What was the biggest learning curve in developing these two heroes? Orisa took a while to learn because I hadn't practiced her at all before she earned a niche spot in the current meta. Other than that, I thought she was an easy hero to play compared to Reinhardt, who I put a lot of time into from the start of my career. You're playing in the same position as Fissure who many deem as one of the best main tank players in the world, how do you two work together when it come to working out the game plan for your next opponents? Fissure and I have subtle differences in our play style. Fissure is slightly more aggressive, whereas I am more of a defensive Winston. We both scrim alternatively and find out what works best. Out of the other teams in the league, which teams and players are you looking forward to playing against the most? I am looking forward to play against strong teams such as Seoul, New York, and Houston. The Spitfire are ranked as one of the best teams in the league, that can go on to win it all. Does this put any pressure on your performance each week? Yes, I do feel the pressure as I am now part of a team that is not an underdog. How have you found the life in Los Angeles compared to South Korea and are you eventually looking forward to coming to London? The weather here in LA is amazing, and I find the food very agreeable. I like it here very much. I have never been to London, so I would really like to go and eat some fish and chips. Finally will you be throwing us out of your pub soon? Get out of my pub. Week four see's Gesture and the Spitfire playing against fellow contenders Seoul Dynasty on Thursday February 1st and then against the team with the worst record in the league the Shanghai Dragons on Saturday February 3rd. I want to thank Gesture for taking time out to answer a few questions and wish the boys good luck going into week four.